The Government's watchdog on the safety of drugs has warned the controversial anti-depressant Seroxat should not be given to people under 18. The drug is the most frequently-prescribed anti-depressant pill in the UK. Thousands of patients have complained of chronic problems trying to get off Seroxat while there are also claims the drug can trigger suicidal tendencies and violence. "It has become clear that the benefits of Seroxat in children for the treatment of depressive illness do not outweigh these risks", the Medicines and Healthcare products Regulatory Authority said. GlaxoSmithKline, which manufactures Seroxat, insists that the drug is safe. 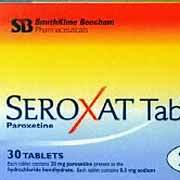 Seroxat, which is similar to Prozac, has been crucial in alleviating depression in millions of people. But others complain of paranoia, dizziness and electrical shocks when they try and come off the drug. Campaigners want the claim that Seroxat is not addictive to be removed from the information given out to patients and for the risk of violence to be acknowledged. The Seroxat Users Group has around 5,500 members, some of whom are involved in legal action calling for improved patient information. Glaxo insists that no valid scientific research has shown that it causes suicidal thoughts or actions. But a jury in the US ordered Glaxo to pay almost £5m two years ago to the family of a man who killed himself, his wife, daughter and granddaughter after two days on the drug. And in March this year, Brecon coroner Geraint Williams said he would ask Health Secretary Alan Milburn for an inquiry after retired headteacher Colin Whitfield, 56, committed suicide by cutting his wrists after taking Seroxat for two weeks. Mr Williams said he had "grave concerns" that Seroxat was dangerous and was "profoundly disturbed" by reports that it had radically changed Mr Whitfield's personality. An expert group from the Committee on the Safety of Medicine was set up last month to look into the effects of Seroxat.